Note: While this review will be spoiler free, it may contain spoilers for the first book in the series. If you’re new to this series, check out our review of Royal Street. Three years have past since Hurricane Katrina and DJ as been promoted to Co-Sentinel of New Orleans, along with shapeshifter Alex. The hurricane not only devastated the city, it also critically damaged the barrier between the Beyond and Now. At the beginning of River Road, we join DJ just days after the wizard council have made the decision to abandon the repairs, instead allowing preternaturals to cross the barrier. Jean Lafitte, the roguish 18th century pirate, is among those to make the crossing, bringing with him news of an issue in the Bayou. Two rival merclans are convinced the other has poisoned the water. It’s up to DJ to figure out what’s making merpeople sick and attempt to broker some piece between the clans. After bodies start turning up and testing of the water brings up some shocking results, DJ races against time to catch the killer before more people loose their lives. After finishing Royal Street (the first in the series) I was excited by the room for growth in the world building and characters and that’s exactly what we get in the sequel. The Bayou setting gives this installment a different flavor to the first book, providing a vivid backdrop for the introduction of the merecreatures, along with other new supernaturals. As the plot unfolds DJ expands her magical repertoire, exploring some less-than-legal but fantastically described spell casting. She also journeys to the Beyond again, under more pleasant circumstances this time, giving glimpses into historical New Orleans that I absolutely loved. Three years is quite a substantial gap between books but I think it worked here, giving DJ a chance to settle into her role as co-Sentinel. She seemed more mature, ready to act as a diplomat as well as enforcing magical law. I love the fact that although she will do her best in a fight, she isn’t a natural and doesn’t really want to be. Unfortunately she isn’t quite so together when it comes to her love life. Even though a few different suitors are featured, it became fairly obvious where DJ’s heart lies, even if she can’t see it. Whilst I enjoy the flirting and some awkward situations, I’m hoping we’ll see DJ make a choice in the next book and run with it. During the Mer investigation it becomes apparent to DJ that wizards aren’t held in the highest of regards when it come to other preternaturals. I got the impression that many feel the wizards hold too much power and would like nothing more than to see that change. I have a feeling this will develop into a major theme in later books, especially as DJ herself seems to be having some misgivings about the Elders and Wizard Council during this book. The river mystery does a great job of bringing together more threads in this expanding world. 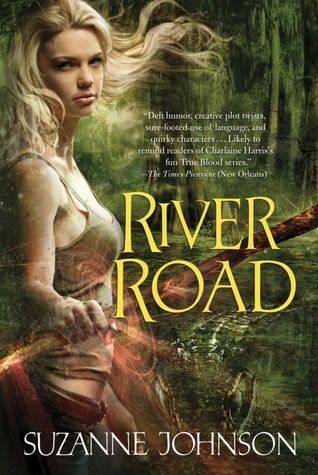 Coupling that with a main character you’ll root for, plenty of magical action and some larger than life secondaries (Jean Lafitte, I’m looking at you), River Road is a fantastic follow up. The Sentinels of New Orleans series is shaping up to be really great addition to the urban fantasy genre. yes I love this series, can’t wait to read book 3! Good review. I love this series too. I have the third book in my TBR pile whispering to me: put the other books on the bottom and read me…. I love this series. EF is my next book to read after my current one.